Re-Posted - How Long are Organizations in Business Resumption Mode after an Event Occurs? It was brought to our attention that a link on a recent posting was not operational. 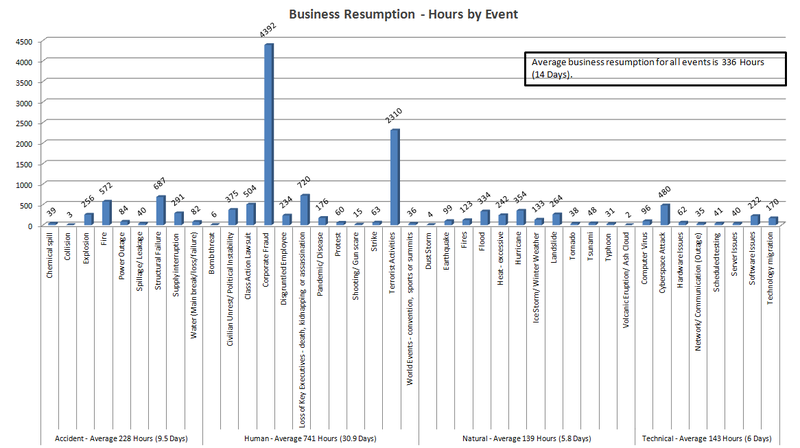 Please view the updated posting at http://www.bcmanagement.com/bcm-blog/how-long-are-organizations-in-business-resumption-mode-after-an-event-occurs to view the link to the data chart. How Long are Organizations in Business Resumption Mode after an Event Occurs? One week left for our 5th Annual BCM Program Management Event Impact Management Assessment Study. Participate today before it's too late. Only study participants will receive a complimentary report (previous sample). Our 5th Annual Event Impact Management Study is now live through November 2, 2014. Only study participants will receive our complimentary BCM Event Impact Management Report, which includes an assessment from our International Benchmarking Advisory Board. BC Management has been conducting BCM data metrics/ assessments since 2001. I can weather any storm. I provided support and leadership at my state’s Emergency Operations Center for almost every natural and man-made disaster over the course of ten years. I worked directly with our governor at times when citizens’ welfare was most at risk. I live and breathe this stuff. I’ve served as the Continuity of Operations (COOP) subject matter expert for a Federal agency with over 62,000 employees. Last year, I completely overhauled the agency’s COOP plan then implemented it with training and exercises. I’m addicted to exercise. Functional and discussion-based exercises, that is. I have planned, conducted, and evaluated dozens of exercises for local, state, and federal government agencies as well as the private sector. I’ve got the credentials. In addition to my CBCP certification, I’ve also been certified by FEMA as a Master Exercise Practitioner (MEP) and a Professional Continuity Practitioner (PCP). I’ve got an instructor certification, and I’ve also got a Top Secret security clearance. Let’s talk about how I can take your organization’s continuity program to the next level! BC Management is assisting several clients with business continuity and disaster recovery job openings. Here's our BCM October Job Update. NEW! ASAP NEED! ITS Continuity Manager - FTE, Contract-to-Hire (Job #2,768) - Nashville, TN - Local Candidates Preferred - No Relocation Assistance. ** Candidates with CBCP/MBCP and ITIL certifications are highly preferred. WORK AUTHORIZATION MUST BE IN PLACE. SUBMITTING CANDIDATES. NEW! ASAP NEED! Lead Disaster Recovery Consultant - FTE, Contract (Job #2,773) - Preference will be given to candidates based in the Midwest or East Coast - 50-75% travel. ** Candidates with VMware and application recovery architecture experience preferred. WORK AUTHORIZATION MUST BE IN PLACE. SUBMITTING CANDIDATES. NEW! ASAP NEED! Cloud Architect (2 Openings) - FTE, Contract-to-Hire (Job #2,771) - Portland, OR. WORK AUTHORIZATION MUST BE IN PLACE. SUBMITTING CANDIDATES. NEW! ASAP NEED! Storage Architect (2 Openings) - FTE, Contract-to-Hire (Job #2,770) - Portland, OR. WORK AUTHORIZATION MUST BE IN PLACE. SUBMITTING CANDIDATES. ASAP NEED! BCP Sr. Analyst - FTE, Permanent (Job #2,757) – Boston, MA - No Relocation Assistance. ** Seeking candidates with 7-10 years business continuity expertise coupled with financial industry experience. WORK AUTHORIZATION MUST BE IN PLACE. SUBMITTING CANDIDATES. Manager, Physical and Personnel Security - FTE, Permanent (Job #2,761) – Ottawa, Canada - Will Assist with Relocation ** Candidates must be citizens of Canada. CANDIDATES CURRENTLY INTERVIEWING. SOX Administrator & Program Coordinator - FTE, Contract (Job #2,764) – Reading, UK - Local Candidates SUBMITTING CANDIDATES. Senior SOX Deputy Director - FTE, Contract (Job #2,763) – Reading, UK - Local Candidates SUBMITTING CANDIDATES. Business Continuity Analyst - FTE, Permanent (Job #2,760) – New York, NY - No Relocation Assistance ** Compensation commiserates with 2-5 years BCM expertise. WORK AUTHORIZATION MUST BE IN PLACE. CANDIDATES CURRENTLY INTERVIEWING. How do Events Impact Organizations? Study Question: What was the impact to the business for the most significant event in each category? Less than two weeks left for our 5th Annual BCM Program Management Event Impact Management Assessment Study. Participate today before it's too late. Only study participants will receive a complimentary report (previous sample). The final report will highlight how organizations are impacted by each event. - Accident: Chemical Spill, Collision, Explosion, Fire, Nuclear Contamination or Uncertainty, Power Outage, Spillage/ Leakage, Structural Failure, Supply Interruption, and Water (Main Break/ Loss/ Failure). - Human Disaster: Bomb Threat, Civilian Unrest/ Political Instability, Class Action Lawsuit, Corporate Fraud, Disgruntled Employee, Government Shutdown, Loss of Key Executives, Negligence, Pandemic/ Disease, Protest, Shooting/ Gun Scare, Strike, Terrorist Activities, War or Insurrection, and World Events (Convention, Sports or Summits). - Natural: Dust Storm, Earthquake, Fires, Flood, Heat - Excessive, Hurricane, Ice Storm/ Winter Weather, Landslide, Tornado, Tsunami, Typhoon and Volcanic Eruption/ Ash Cloud. - Technical: Computer Virus, Cyberspace Attack, Hardware Issues, Network/ Communication (Outage), Scheduled Testing, Server Issues, Software Issues and Technology Migration. Location: Candidate may be based in any large metropolitan city – preference will be given to candidates on the East Coast and Midwest. The Sr Lead Technology Consultant participates in developing solutions that assist customers enhance their ability to consistently and efficiently recover critical information systems and data in the event of a Disaster. The ideal candidate for this position will possess a deep and broad understanding of Disaster Recovery technology solutions and business continuity. The candidate should have a background in storage, networking, and server administration concepts. The candidate develops, documents, and implements DR solutions. The candidate must be able to demonstrate excellent verbal and writing skills to intelligently communicate with client technology leaders about solution components, requirements, and benefits in the areas of business, technology, and finance. The candidate must be comfortable with business travel (up to 50%), creating, reviewing, and delivering customer deliverables (technical architectures, presentations, Disaster Recovery run books, etc.) for Company customers and should be able to quickly learn and integrate Company product offerings. As a senior member of the consulting organization, this candidate must be able to mentor junior members of the team and lead small teams (4-7 people) in the consulting group on engagements. In addition to focusing on project delivery for customers, the ideal candidate must provide pre-sales support for the solutions engineering teams on potential engagements. • Mentor and help broaden practice members knowledge of specific DR technologies, processes, and procedures. • Subject matter expert in the area of Disaster Recovery Enablement with knowledge of DR solutions that automate failover of applications, data, and infrastructure to a Recovery site in the event of a Disaster using knowledge of SAN and database replication techniques, backup and Recovery technology, load balancing technologies, and application specific Recovery techniques. • Proficiency in infrastructure technology areas including server hardware, operating systems, networking, storage, virtualization, automation, and orchestration, and cloud architecture. • Working knowledge of application workload profiling, remediation, and migration. • Strong communication skills including excellent presentation and public speaking talent. • Having broad expertise or unique knowledge, uses skills to contribute to development of company objectives and principles and to achieve goals in creative and effective ways. • Works on significant and unique issues where analysis of situations or data requires an evaluation of intangibles. • Exercises independent judgment in methods, techniques and evaluation criteria for obtaining results. • Creates formal networks involving coordination among groups. • Acts independently to determine methods and procedures on new or special assignments. To be considered for this position, please submit updated resume and short bio to http://www.bcmanagement.com/search-jobs.html and reference Job Order # 2773. A result oriented, experienced and energetic Business Continuity Professional, certified to the latest standards and admitted Member of the Business Continuity Institute U.K. (MBCI), who is well aware of industry certifications like BS25999 and ISO22301 and therefor to be considered as an asset for a BC/DR position in your team. He/she possesses an extensive experience within an international Business Continuity environment, building and utilizing highly evolved relationship management skills at all levels of the organization. He/she lead and worked as part of virtual teams, designing, developing and implementing strategic BC programmes, including associated effective management information reporting to a wide spectrum of clients. Previous roles have also enabled him/her to gain a wealth of management-experience as a line manager to both hard-wired and virtual teams. This applicant is eager to join a company that values his/her expertise in business resumption plan development, project management and execution. Business Continuity Consultant - ASAP NEED! To be considered for this position, please submit updated resume and short bio to http://www.bcmanagement.com/search-jobs.html and reference Job Order # 2756. Travel: Minimal travel - must be able and willing to travel based on assignments and program demand. Travel requirements may include international travel. **All candidates must be authorized to work in the United States. **All candidates will need to pass a background check. ** CBCP/MBCP and ITIL certifications highly preferred. A client of BC Managements is seeking a seasoned IT Continuity Manager - Information Technology Infrastructure Library (ITIL). Position is responsible for developing a stronger Continuity Management program and reports to Service Management. This role is accountable to ensure that ITIl V3 framework and methodology is adhered to in our service environment and that plans and Continuity processes are regularly reviewed in terms of their ability to meet business requirements with high quality service .The ITS Configuration Manager is responsible for coordinating and controlling ITIL-based process, policies, and procedures for efficient and prompt handling of all IT service transitions while maintaining the goals and objectives of minimizing the impact to the business; improving day-to-day operations of the IT organization; and delivering value to the business and our internal customers are met. • At least 3 year experience in organizational transformation within a large corporation. • Or ITIL certification, with expert experience (3 years) in Continuity management or Business Continuity Management. • Similar qualifications in fields outside of IT will be considered. • Bachelor's Degree in Service Management is preferred. A Bachelor’s degree in a technology related field such as Computer Science (e.g. Electrical Engineering, Systems Engineering, Mechanical Engineering, etc.) from an accredited four-year college or University will be considered based on specific experience in Continuity Management. • At least 5 years’ experience in one or more: CA Unicenter, Asset Portfolio Management; BMC Atrium; Tivoli (CCMDB); HP (UCMDB); ServiceNow; Altris; ASG; LANDesk; iET Solutions. • At least 5 years’ experience in working in a large corporation with cross functional experience and exposure providing service or support for IT infrastructure services using related ITSM processes. • At least 5 years’ experience in configuration management or IT Services asset management. • At least 3 year experience in analyzing raw operational data and turning it into meaningful business information and knowledge, for consumption by various audiences. Including scorecards, dashboards, report cards, service maps, dependency views, etc. • At least 3 year experience as a key contributor to the integration of people, processes and tools within the overall delivery environment, how they impact Change Management, Problem Management, Configuration Management and Incident Management services delivered to the client. • At least 1 year experience in Six Sigma. Understanding of Data Center Infrastructure; Unix, Linux, VMWare ESX, Networking, Oracle DB / Weblogic Server. The role reports to the ITS Service Management (ITSSM) team – They deliver and manage a suite of common processes and services for IT&S, based upon the ITIL framework. The team aims to deliver the processes, standards and tools to support Service Delivery teams across ITS in delivering a stable and highly reliable suite of applications and infrastructure. Processes include Incident, Crisis, Problem, Change, Configuration, Event, Capacity, Reporting, and for ensuring compliance to processes across ITS. In addition, the group has responsibility for key management steering committees, process improvement and architecture which support ITSM. The team also has responsibility for continuous improvement of these areas. As part of a major transformation program, a new Service Management initiative is being rolled out across the ITS organization. This department will become a strategic location and delivery center for ITS in support of its service management objectives. This is an exciting new opportunity to be part of a team that will change the landscape of ITS Service Management delivery at the client. The ITS Continuity Manager - Role has two key parts to it. As the Continuity manager for the clients the role requires conferring with technical groups and customers to obtain additional information or to interpret policies and procedures for business needs into qualified Continuity plans. They will create and maintain a relevant Continuity Program ensuring strong plan integrity from all sources. This will be done in close liaison with the other teams (Global) to ensure consistency of approach and standard of operation. The role requires management of all aspects of the day-to-day practices of the services operated from US, ensuring that all processes and activities are operated efficiently and effectively. The key purpose is to improve the overall quality of service in order to reduce incidents related to events leading to failures. Provide leadership support and strategic information to the Service Management team in ITS. Support the Head of Service Management Operations in building and developing the Service Management capability within ITS to ensure the long-term stability of the program. Drive the performance of the team to achieve defined performance targets and KPIs to ensure that there is a maturation of the program. Optimize the Continuity Management program to deliver quality outcomes that lead to high levels of customer satisfaction. Continually seek to improve the quality, productivity and culture of the service, owning any associated policies and standards. Ensure timely and consistent review of standards & policies linked to services to ensure their operational readiness and effectiveness. Establish and maintain appropriate training material and process documentation in conjunction with the other managers. Support the Head of ITS Enterprise Operations in the definition of the strategy and long-term plans for the services and the implementation of Service Improvement Projects. Identify and implement improvements to services by enhancing the linkage with other ITSM services (e.g. Incident & Problem Management). Provide accurate and timely input into the ITS scorecard to track delivery against Key Performance Indicators to which Continuity Management has a direct influence. Ability to clearly communicate, written and verbally, to a variety of audiences, including the ability to influence across the organization. To be considered for this position, please submit updated resume and short bio to http://www.bcmanagement.com/search-jobs.html and reference Job Order # 2768. The Disaster Recovery (DR) team makes sure that the clients technology infrastructure remains in a ready state of preparedness to address events that may impact the company’s ability to complete processing at any given data center(s) location. The team coordinates and executes recovery exercises to prove that failover capabilities exist, enabling uninterrupted business operations and IT services. With a focus on continuous improvement, the team enhances the clients DR capabilities by developing short and long-term strategies, and implementing action plans to improve resilience and the overall DR service offering. • Perform DR coordination responsibilities, including leading recovery exercises and real events. • Develop and upkeep DR procedures (run books and Gantt charts). • Manage DR testing schedules and exercise registration. • Drive efficiencies in DR processes and ensure continuous improvement. • Coordinate DR exercises and manage real recovery events. • Develop recovery procedures (run books and Gantt charts) and new DR solutions. • Maintain golden copies of DR procedures. • Manage DR testing schedule to meet business/regulatory/audit requirements. • Manage exercise registration to ensure proper SME availability to support successful testing. • Lead post-mortem discussions to resolve problems and issues. • Work with SMEs across the firm to drive results toward improving DR capabilities. • Drive efficiencies in DR processes and support continuous improvement. • 10+ years working in IT/Infrastructure. • Cross-functional IT/infrastructure experience preferred. • Process and/or engineering background a plus. • Infrastructure background with diverse understanding of platforms, applications, storage/replication, networking, servers, mainframe, and failover/recovery automation. • Ability to drive and develop repeatable processes and build efficiencies into existing processes. • Experience with MS Project. • Strong technical writing skills. • Technology degree such as Computer Science or Engineering preferred. To be considered for this position, please submit updated resume and short bio to http://www.bcmanagement.com/search-jobs.html and reference Job Order # 2767. Compensation (annual salary): The Bank offers a competitive total compensation package with starting salaries, based on qualifications, generally ranging between $94,290 and $117,862* (job grade 19). *Where the Bank has needs for specialized skills, it may offer higher cash compensation to exceptional candidates. Reporting to the Assistant Director of Security, the Manager of Physical and Personnel Security is responsible for managing the day-to-day operational security function to ensure the safeguard of the Bank’s infrastructure and personnel. The Manager is accountable for the management and functional integrity of the integrated personnel security screening and security control systems (i.e., card access, alarms, cameras) for all Bank sites; security monitoring and response; and for the Security Officers/Operations at four Bank locations. You have responsibility for the management of a team of approximately 60 employees, including direct reports (team leads and supervisors) and a mix of union and non-union staff. You have responsibility for the annual budget for Security Operations, including accountability for sound financial management and the efficient and effective management of financial resources. You maintain vendor-contractor relationships to ensure that the best value is delivered to the Bank, and recommend implementation of contract remediation, contract re-tendering, legal recourse or strategic tendering strategies. You have accountability for the physical security posture of Bank sites by ensuring that standardized security operational standards and procedures are in place, officer training is up to date and exercise programs are followed, and by providing subject-matter expertise, advice and support to site Operations Managers. You manage and lead security-oriented renovation and installation projects and studies and are a key resource for internal and external project-management initiatives. You establish and maintain effective and collaborative business relationships both within the Bank and with external stakeholders, including with lead intelligence, security, facilities and safety agencies of the federal government, other levels of government and the private sector. You manage physical security operations and are responsible for ensuring that buildings meet all applicable security standards and are positioned to respond to security emergencies. You also direct and make appropriate assignments for corrective action and response to emergencies, and play an integral role in the Bank’s Continuity of Operations Program (COOP). You coordinate and oversee physical and personnel security investigations. You also coordinate and oversee the management of incidents involving physical and personnel security. • university degree in criminology, law, psychology or a relevant field. • Condition of employment: Candidates must be eligible for secret clearance. • Priority will be given to Canadian citizens and permanent residents. • Relocation assistance may be provided, if required. • Key benefits offered include: health and dental care, sick leave, paid vacation, short-term and long-term disability, life insurance and defined-benefit pension plan. • Only the candidates selected for an interview will be contacted. • The Bank of Canada benefits from the unique perspectives, attributes and talents of its diverse workforce. We offer flexibility to accommodate the needs of our employees and candidates. The Bank of Canada is committed to employment equity and actively encourages applications from qualified men and women, including Aboriginal peoples, persons with disabilities, and members of visible minorities. • We will ask you to complete a mandatory questionnaire during the application process. To be considered for this position, please submit updated resume and short bio to http://www.bcmanagement.com/search-jobs.html and reference Job Order # 2761. Rémunération (salaire annuel) : La Banque offre un programme de rémunération globale concurrentiel et un salaire à l’embauche allant habituellement de 94 290 $ à 117 862 $* (niveau de poste 19). * Dans les cas où elle doit pourvoir des postes dans des domaines de spécialisation particuliers, la Banque peut offrir une rémunération pécuniaire plus élevée aux candidats exceptionnels. Sous la supervision du directeur adjoint, Sécurité de la Banque, vous êtes responsable de gérer les opérations de sécurité courantes afin d’assurer la protection de l’infrastructure et du personnel de la Banque. Vous êtes également chargé de la gestion et de l’intégrité des systèmes intégrés d’enquêtes de sécurité sur le personnel et de contrôle de sécurité (accès par carte, alarmes, caméras) dans toutes les installations de la Banque; de la surveillance et des interventions liées à la sécurité; et des agents et opérations de sécurité dans quatre bâtiments de la Banque. Vous gérez une équipe d’une soixantaine d’employés syndiqués et non syndiqués, dont certains sont vos subordonnés directs (chefs d’équipe et superviseurs). Vous êtes responsable du budget annuel des Opérations de sécurité, y compris d’assurer une gestion financière saine, efficiente et efficace. Vous entretenez des relations avec les fournisseurs afin d’obtenir le maximum de valeur pour la Banque et recommandez la mise en application de stratégies de correction de contrat, de lancement d’un nouvel appel d’offres, de recours judiciaire ou d’appel d’offres stratégique. Vous assumez la responsabilité de la sécurité physique des lieux occupés par la Banque en veillant à ce que des procédures et des normes opérationnelles uniformisées en matière de sécurité soient mises en place, que la formation des agents soit à jour et que les programmes d’entraînement soient suivis, et en fournissant des conseils relevant de votre domaine de compétence ainsi que du soutien aux responsables des opérations. Vous gérez et menez des études et des projets de rénovation et d’installation axés sur la sécurité et jouez un rôle de personne-ressource dans la gestion d’autres projets internes et externes. Vous nouez et entretenez des liens de collaboration fructueux au sein de la Banque et avec des entités externes, y compris les principaux organismes chargés du renseignement, de la sécurité ou des installations du gouvernement fédéral, d’autres paliers de l’administration publique et du secteur privé. Vous gérez les opérations de sécurité matérielle et êtes responsable de veiller à ce que les bâtiments respectent toutes les normes de sécurité applicables et permettent de réagir aux situations d’urgence relatives à la sécurité. Vous dirigez aussi les opérations et assignez les tâches en cas d’urgence ou de mesures correctives à prendre et participez à tous les aspects du Programme de continuité des opérations (COOP) de la Banque. Vous coordonnez et supervisez les enquêtes concernant la sécurité matérielle et du personnel, de même que la gestion des incidents liés à la sécurité matérielle et du personnel. • Condition d’emploi : Les candidats doivent être admissibles à l’obtention d’une autorisation de sécurité de niveau « secret ». • La priorité est donnée aux citoyens canadiens et aux résidents permanents. • Les principaux avantages sociaux offerts sont les suivants : soins médicaux et dentaires, congés de maladie, congés payés, invalidité de courte et de longue durée, assurance vie et régime de pension à prestations déterminées. • La Banque communiquera uniquement avec les personnes retenues pour une entrevue. • La Banque du Canada bénéficie des points de vue, des attributs et des talents particuliers de son effectif diversifié. Elle offre à ses employés et aux candidats à un poste la flexibilité nécessaire pour répondre à leurs besoins. La Banque souscrit aux principes de l’équité en matière d’emploi et incite fortement les hommes et les femmes – y compris les Autochtones, les personnes handicapées et les membres des minorités visibles – ayant les compétences appropriées à présenter leur candidature. • Dans le cadre du processus de recrutement, les candidats devront obligatoirement remplir un questionnaire. • Le genre masculin est utilisé comme générique à seule fin d’alléger le texte. Vous trouverez ci-dessous une description de la nature générale du poste et du niveau du travail effectué. Il ne s’agit pas d’une liste exhaustive des responsabilités et des tâches réalisées ni des compétences requises dans le cadre du poste. Le dossier de tous les candidats qualifiés sera pris en considération sans discrimination fondée sur la race, la couleur, la religion, l’origine nationale ou ethnique, l’âge, le sexe ou tout handicap. Pour présenter votre candidature à ce poste, visitez le http://www.bcmanagement.com/search-jobs.html et entrez 2762 comme numéro de poste. Pour obtenir de plus amples renseignements sur le poste, veuillez communiquer avec Cheyene Marling, de BC Management Inc., à cmarling@bcmanagement.com ou au 1 714 969-8006. What is the Estimated Financial Loss Due to Events Impacting Organizations? Study Questions: To the best of your ability, please estimate the financial loss for the most impactful event in each category. Add up the total estimated financial loss with all the DIRECT and INDIRECT losses. Please specify in US Dollars. Just two weeks into our 5th Annual BCM Program Management Event Impact Management Assessment and we're already starting to assess the study findings. The final report will highlight the estimated financial loss by each event. Business Continuity Program Manager at Fortune-listed companies in energy and financial industries is looking for a new opportunity. With fourteen years dedicated to Business Continuity and Disaster Recovery, this candidate possesses the skills and experience to develop, coordinate, and maintain a Business Continuity and Disaster Recovery program for a multi-site national or global enterprise. Key areas of expertise include strategy and plan development, Business Impact Analysis, program implementation, BCP and IT DR exercises, and development of training programs. Methodologies emphasize standardization and simplification of processes and documentation. The candidate appreciates opportunities for process improvement, customizing solutions to meet a company's needs, and providing thought leadership in the area of plan development. This candidate has successfully coordinated over 30 recovery exercises for several Fortune 500 companies and has the skill set to establish a robust testing program that is repeatable and emphasizes remediation and continuous improvement. Candidate has experience leading virtual and global project teams and has extensively worked with third parties such as SunGard and HP, including contract negotiations. The candidate has also managed several incidents through to post-incident remediation. j. Minimum of ten years including Global SOX, internal audit, corporate governance with multi-national design construction, manufacturing engineering and development companies. To be considered for this position, please submit updated resume and short bio to http://www.bcmanagement.com/search-jobs.html and reference Job Order # 2763.
h. Excellent communication, management and leadership skills and proven abilities to utilize documentation and testing tools to enable and coordinate all process activity. i. Minimum of 5 -7 years including Global SOX, internal audit with multi-national design construction, manufacturing engineering and development companies. To be considered for this position, please submit updated resume and short bio to http://www.bcmanagement.com/search-jobs.html and reference Job Order # 2764.